Left: Daniel Owens, appointed CEO of Emory University Hospital Midtown. Right: Marilyn Margolis, named CEO of Emory Johns Creek Hospital. After an extensive search and interview process, Emory Healthcare has appointed two new chief executive officers (CEOs) to oversee two of its top hospitals. 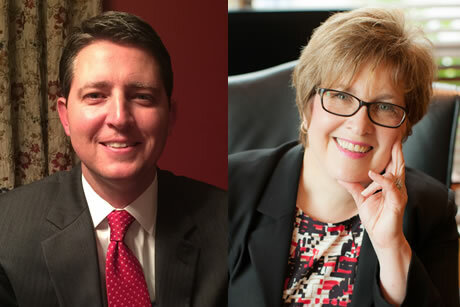 Marilyn Margolis has been named CEO of Emory Johns Creek Hospital, and Daniel Owens has been appointed CEO of Emory University Hospital Midtown. Margolis has been serving as interim CEO, chief nursing officer (CNO) and vice president of operations at Emory Johns Creek Hospital. Owens has been serving as interim CEO and vice president of operations at Emory University Hospital Midtown. Margolis began her career at Emory Healthcare as a nurse more than 30 years ago. She has extensive experience leading quality initiative nursing teams throughout the Emory Healthcare system, in areas such as emergency services and intensive care at Emory University Hospital and Emory University Hospital Midtown. In 2011, Margolis was named CNO of Emory Johns Creek Hospital and in 2013, she was promoted to CNO and vice president of operations at the hospital. Most recently, she was named interim CEO in Sept. 2014. Notably, Margolis is the recipient of Georgia Hospital Association’s 2013 Lifetime Achievement Award. Owens began his tenure at Emory in 1994. During his 20-year career at Emory, he has held numerous operations positions within Emory Hospitals and the Emory Clinic. He also served as corporate controller for Emory’s Corporate Finance Department. In Sept. 2014, he was named interim CEO of Emory University Hospital Midtown, while also holding the title of vice president of operations at the hospital, a position he held since 2012. "Marilyn and Dan have both been with the Emory system for many years, and it is not only their tenure with the organization that made them the perfect fit for these positions, but also their combined skill and knowledge of our health care system that was an advantage," says Dane Peterson, Emory Healthcare Hospital Group President. "These two individuals rose above the rest as true leaders and innovators who will partner with our physician and staff teams to drive continued success in our hospitals." Margolis succeeds former Emory Johns Creek Hospital CEO Craig McCoy, who was selected as CEO of Emory Saint Joseph’s Hospital in Sept. 2014. Owens succeeds former Emory University Hospital Midtown CEO Dane Peterson, who was named Emory Healthcare Hospital Group President, a new position, in Oct. 2014. Margolis and Owens assumed their new posts on Jan. 4, 2015. They will begin the search for replacements of their former positions in the coming weeks. Emory Johns Creek Hospital is a 110-bed acute care facility located in the heart of Johns Creek, Georgia. Since its opening in 2007, Emory Johns Creek Hospital has established an outstanding reputation as a quality health care provider, delivering community-based health care to a rapidly growing and diverse segment of metropolitan Atlanta. In 2010, Emory Healthcare became the sole owner of the facility. The hospital offers a range of services including emergency care, advanced digital imaging, a birthing center with a Level III neonatal intensive care unit, adult intensive care, women’s services, cardiology, surgery, oncology and a bariatric center. Emory University Hospital Midtown is a 511-bed community-based tertiary care hospital located on Peachtree Street in midtown Atlanta. It is staffed by more than 1,100 Emory School of Medicine faculty physicians and 400 private practice physicians. More than 2,600 staff members work at the hospital. Emory University Hospital Midtown is well known for its services in cardiology, cardiac surgery, gastroenterology, maternal and infant care, neurosurgery, oncology and emergency medicine.